Since we had our third child two months ago, I have been painfully reminded about the real use of diapers and how they are actually designed. If you don't have kids, you may have been sucked into the false reality that diapers are meant to contain poop and pee. They actually are created with many convenient features such as quick release fasteners and easy leak leg holes. Usually it takes a special trigger to release the functionality of these features. This can be anything such as sitting in a shopping cart, walking out the door already 15 minutes late to your appointment, and already going through every outfit you own for your baby by 1 pm. Because of this misunderstanding, I put together this helpful diagram to show you all the hidden awesomeness of diapers that you always knew they had, but couldn't put into words because your baby woke you up at 1 am, 3 am, 4 am, and 6 am. 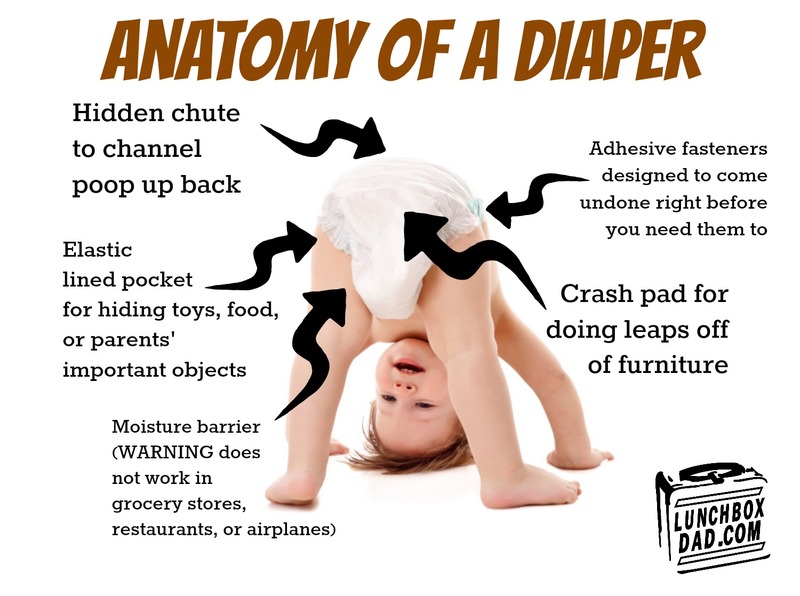 So enjoy, share this to help others, and let me know below what your favorite hidden features of diapers are or even your favorite diaper story...Don't hold anything back! This is awesome! Don't forget how those pesky tabs have a habit of tearing off while trying to get the diaper on in the first place! Rendering a perfectly good, brand new diaper useless! I think ours have an emergency pull string for immediate pressure release. Funny read! Thanks Sarah and yeah those little tabs are awesome at tearing off. Especially when you are changing a little boy and you know its like a ticking time bomb and you have no idea when you are going to get hosed down or not. You just know you better get that diaper on quick! Thanks Matt. Yours has that too? its like they've been saving it up because they know its coming!